Is there a connection between artificial sweeteners and autism? Artificial sweeteners are common sugar substitutes and their safety has been analyzed and questioned over the year. Find out what is currently known about artificial sweetener safety and any possible connections to autism. Each of these chemical sweeteners has critics who claim that long-term use can produce health problems. Most notably, the oldest sugar substitute, saccharin, was shown to cause bladder cancer in lab rats. For years, all saccharin products indicated that the ingredient caused cancer in laboratory animals, but this label was recently dropped due to recent studies which showed no cancer risk to humans. Critics of aspartame have blamed it for a slew of health problems ranging from seizures and memory loss to fatal illnesses. However, no scientific evidence has backed any of these claims and aspartame is FDA approved. 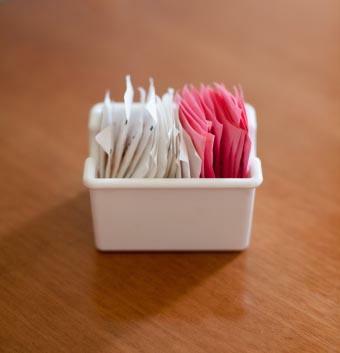 The FDA recommends a safe daily dosage for artificial sweeteners based on their studies. It is best for consumers to follow FDA serving guidelines when using these sugar substitutes. As the search for possible causes of autism continues, the question of a possible link between artificial sugar substitutes and autism arose. There have not been any major scientific studies on the connection between artificial sweeteners and autism. The most vocal voice raising questions of possible connections between chemical sweeteners and autism is the Internet. Among the blogs and autism family sites, people have questioned whether their own use of artificial sweeteners played a role in their children's development of autism. A number of autism advocacy groups have also raised questions about sugar substitutes and other chemicals in food. Some of these sites approach the issue in an alarmist fashion and warn people away from using chemical sugar substitutes without any scientific evidence. Others are people simply questioning a possible autism cause and warning people that maybe it is best to avoid chemical sweeteners. Practitioners of biomedical autism treatments generally recommend that people avoid chemical sugar substitutes and use natural organic foods. The concern of families and these groups may lead to more autism research into the issue. Do Artificial Sweeteners Cause Autism? The cause of autism is unknown. Ongoing research examines possible causes, including possible connections to environmental factors, such as diet or food influences. The lack of significant studies make it difficult to say whether or not there is any possible link between artificial sweeteners and autism. At this time is seems unlikely based on the limited information. More research is necessary to determine any connections between autism and artificial sugar alternatives. The many concerned families who question whether or not artificial sweeteners are safe and if any of them led to a specific case of autism are a presence online that may encourage more research into the matter. The fact that the question of links between chemical sweeteners and autism has been raised numerous times online may lead scientists to include artificial sweeteners in their environmental toxin studies. Since the FDA approves the use of artificial sweeteners, people should feel safe using the sugar substitutes according to the label directions. The Mayo Clinic also recommends that people do not overuse chemical sugar substitutes, understand their possible health risks and use natural sugar alternatives to sweeten food instead.